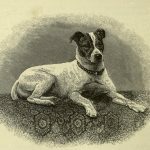 Man’s best friend is well represented with this collection of vintage black and white dog drawings. Each of the dog images has been carefully selected with crafters in mind. Feel free to add these images to your next scrapbooking, mixed media art, rubber stamping, embroidery, card making or other creative project. The original artist’s information is included to showcase their work even though all of these images are now in the public domain and are copyright free. Vintage fox terrier drawing of a dog named spot. 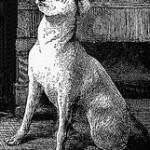 Black and white illustration of a dog who perhaps was a favorite of Queen Victoria. 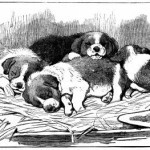 A pile of sleeping puppies on straw. An oh-so-cute black and white dog drawing that will steal your heart. Charming vintage portrait of a dog. 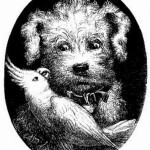 Black and white, public domain dog drawing. Vintage sketch of a pointer. 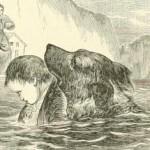 Drawing of a heroic dog saving a child. 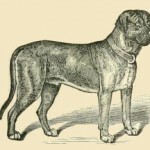 Vintage drawing of a white dog. 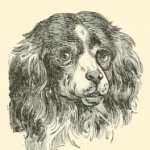 Black and white public domain dog drawing. 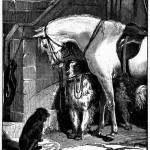 A large dog takes charge and leads a horse to safety in this charming, vintage drawing. Fun drawing of a parrot and a dog seeing each other eye to eye. 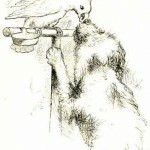 A charming drawing of a dog getting a treat from a parrot. 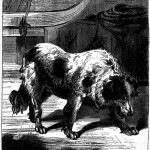 Drawing of a tired dog on a ship.